WYNDHAM’S human residents were not the only ones to receive a gift this Easter. On Easter Sunday animals at Werribee Open Range Zoo enjoyed their own special Easter treats, hunting for brightly coloured pinata eggs and tucking in to homemade hot cross buns. Created by Zoo volunteers, the treats were part of the daily enrichment program at the zoo, which includes a range of activities and items to provide variety and encourage problem-solving and foraging behaviours. Each species is different and has its own enrichment program supported by the zoo’s team of volunteers, who make, grow, cook and build items to the specification of keepers and vets. On Sunday, the zoo’s western lowland gorillas, Motaba, Yakini and Ganyeka enjoyed their own Easter egg hunt as they broke into their pinata eggs to find hidden treats including sultanas and popcorn. 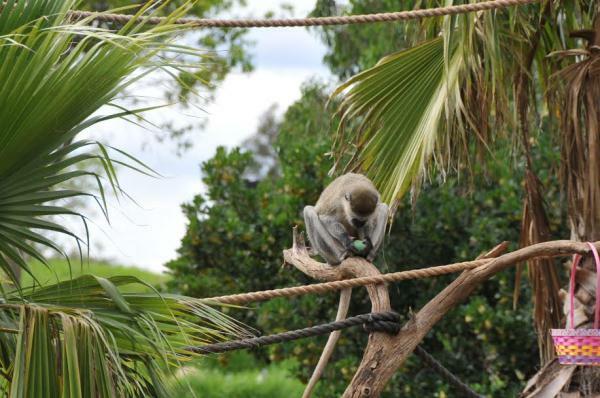 Special hot cross buns made with chickpea flour, grated vegies and a dollop of cream cheese were on the menu for the vervet monkeys along with one of their favourite treats – boiled eggs. The meerkats enjoyed foraging for hand-dyed eggs in a nest of wood wool, while later in the day the zoo’s lions and servals also enjoyed some their own Easter pinatas. The special Easter activities also put the spotlight on the eastern barred bandicoot – a critically endangered Australian marsupial. Instead of a traditional Easter bunny, images of an eastern barred bandicoot featured in many of the Easter enrichment activities, providing keepers with an opportunity to chat to visitors about conservation efforts to save this very special Australian native.